"'A Road to the Ranges'...is another good thing. The landscape is represented under full sunlight, the yellow road dotted with figures on 'the wallaby', the ranges showing up darkly blue in the distance'. 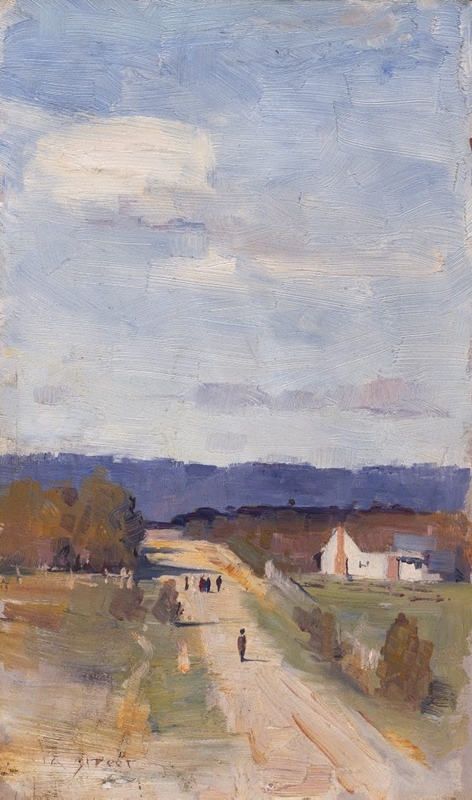 During the summer of 1888-1889 a young Arthur Streeton travelled by train to the beautiful surrounds of Heidelberg, 12 kilometres north-west of Melbourne. There Streeton managed to secure the homestead Mount Eagle after striking up an acquaintance with the brother-in-law of artist David Davies which enabled him to live, paint and teach in the area for the following two years. It was also here that the artist would - along with Tom Roberts and Charles Conder - organise the landmark 9 by 5 Impressionism Exhibition held at Buxton's Rooms, Melbourne, in August 1889. Conceived by the older Roberts who had encountered second-hand examples of impressionism whilst studying in London (1881-1884), the 9 by 5 Impressionism Exhibition was central to the development of the so-called 'Heidelberg School' and a turning point in the history of landscape painting in Australia. Its purpose, as stated in the decorative catalogue, was 'to render faithfully, and thus obtain first records of effects widely differing, and often of very fleeting character'. 'A road to the ranges' 1889 was one of the forty impressionist paintings by Streeton included in the show. The picture depicts a trail presumably leading toward the Dandenong Ranges from Mount Eagle, east of the Yarra basin. Streeton's broad brushstrokes and tonal harmonies capture momentary effects of afternoon light and shadow on an autumnal landscape. Signed l.l., incised "A Streeton". Not dated.